Explore the dazzling Indian Ocean from different perspectives with this special aquatic escape. Visit the nearby island of Kudarikilu for an immersion in authentic Maldivian life. Set out in search of dolphins dancing in the waves. 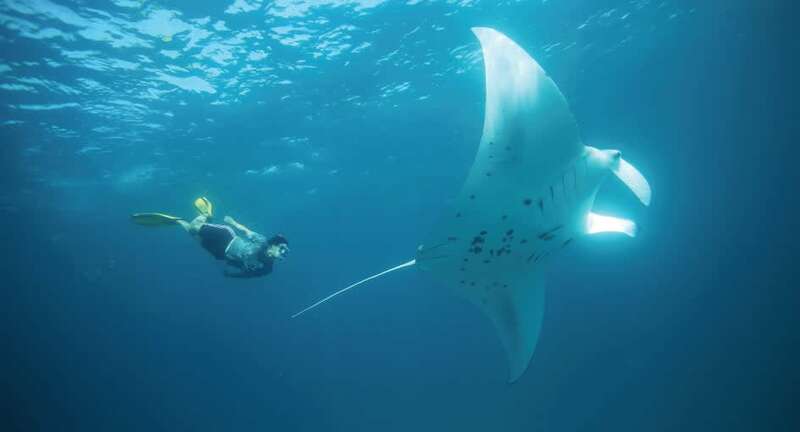 Snorkel the aquamarine waters to catch a glimpse of a turtle as it glides elegantly past, or seek out a migrating school of majestic manta rays. Enjoy a real James Bond moment as you dive into the ocean on the latest Seabob model. With our experienced PADI dive team providing expert instruction, our house reef is the perfect place for novice divers to gain confidence in the water, while stunning coral reefs are teeming with colourful sea creatures, offering a surreal underwater world for you to explore. *Seasonal depending on the manta ray migration May - November. The above package inclusions are for two adults. The rates quoted are per room per night, including savings, subject to seasonal variations and change without notice. Rates noted above are based on recent currency exchange data. The rate indicated on your confirmation is in the official hotel currency and will be charged at that rate on check-out. Minimum five-night consecutive stay required. Maximum of two children under 12 years old who share their parents’ villa stay free of charge, including all meals (from the children’s menu only) and all taxes, except Christmas Eve and New Year’s Eve for which compulsory buffet dinner rates apply.